The students of Mekaela Academies receive free basic medical care through the Mekaela Micro Medical Scheme (MMMS). The children receive outpatient treatment in five surgeries or clinics. 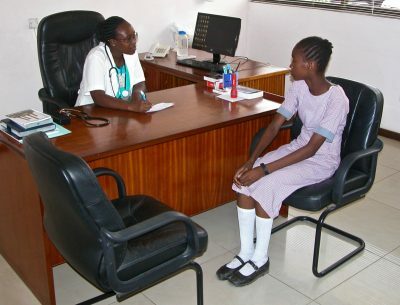 Basic care means that chronic diseases and complicated cases cannot be treated free of charge. In such cases, usually the National Hospital Insurance Fund (NHIF) will cover the expenses, or the parents must bear the costs. More than 90% of all “normal” cases, from injuries from malaria and typhus to dental treatment, are covered by MMMS. The MMMS programme benefits all. The children fall ill less often and recover quicker. The parents do not delay seeing a doctor until the last minute because they are afraid of the costs. Or, which can also often happen instead of a doctor, they visit a medicine man, as he demands only a few Shillings for his work. The doctors receive their reimbursements on time and guaranteed. It is not unusual in Kenya that patients pay with a chicken or a goat because they do not have enough money. Of course, such a programme doesn’t come for free. It costs 2 Euros per month to secure basic medical care for one child. For the children who are sponsored, their sponsors pay a surcharge of 24 Euros per year. Actually, in the beginning MMMS was intended for sponsored children only, but then, as so often in the history of Watoto, we were lucky again. Rudolph Logistics Group in Baunatal, where Watoto was founded, heard about MMMS and decided to fund the programme for children who have no sponsorship. Since 2012, Rudolph Logistics has been a pillar of MMMS with a significant donation every year. In 2013, Ratinga Primary School became the fifth school of Mekaela Academies. For students without a sponsorship, the dental surgery of Dr. Brauner + Dr. Rendchen as well as the support group of Diakonie and Caritas e.V. both located in Ratingen, are funding the MMMS programme. How does it work, and why does it cost only 2 Euros per month? The doctors receive a lump sum per case with which they are to treat the children and prescribe medications up to a total of 1,000 Shillings free of charge. The expenditure is capped, i.e. if a certain number of treatments are exceeded, the lump sum will be reduced. Therefore we can never spend more money than we have. After each treatment, the doctors document the diagnosis, the treatment and the prescribed medications in an internet database. This information, e.g. documents previous illnesses, drug compatibility or allergies and is available to all doctors. The administration has access to the data and can, for example, reject a reimbursement or exclude members from the programme in case of abuse. MMMS is a success, more than 6,000 treatments have been conducted since 2011, which vouch for that. Thus, with the experience of seven years under the belt we think it is feasible to introduce the programme to other schools in the Kwale region. A primary school in Kwale has an average of 400 students. The annual cost to provide basic medical care to 400 children i.e. a complete school is 400 x 12 months x 2 Euros = 9,600 Euros. That is a lot of money, but if it can help 400 children and their families effectively and sustainably, it is certainly worth it. If you are an entrepreneur or manager and you are interested in MMMS sponsorship perhaps as a part of your CSR, please contact us. We would be delighted to discuss the matter with you.